FastShip is an easy-to-use, yet powerful program for designing hulls, superstructures, appendages, and other marine structures, with the ability to design fair surfaces quickly and accurately. FastShip's flexibility allows any hullform type to be represented, and hull features such as bossings, bulbous bows, twin skegs, chines/knuckles, broken sheerlines, and circular bilge turns are readily incorporated into the model. FastShip is used in the design of all types of vessels, and can automatically produce new hulls from a set of parameters, such as ship type, overall dimensions, displacement, LCB, and form coefficients from parent hulls included with the system, or customer-created parent hulls. This gives the ability to customize the program to work with your existing library of hull forms. Multiple surfaces can be created in Fastship; intersections between them can be displayed, and the part of a surface on one side of the intersection can be trimmed away. This capability facilitates the creation of appended skegs and thruster tunnels while maintaining the correct wetted surface and displacement for the hydrostatics outputs. FastShip can export AutoCAD DXF files to create a traditional 3-view lines drawing or to support creation of a general arrangement drawing. It also has the ability to import and export Rhino 3 and 4 files, including the preservation of intersection curves and trimming. Other outputs are IDF offset files that can be used by Visual SMP and GHS, as well as GHS's native "GF" format and IGES 128 for use in solid modeling. With these features, the intersection(s) between any surfaces is found, and becomes a curve on the surface. The intersection curve can be refined to any tolerance, just like the sections. Intersection curves are re-computed in real-time as the surface is modified. Surfaces can be trimmed to these intersection curves, as well as to other sections (stations, buttocks, waterlines, etc.). Trims are recomputed after every surface modification. FastShip has always had the ability to measure the curvature of a section with a feature called "porcupines". Porcupines are plotted along the curve, and the quill length at each point is inversely proportional to the radius of curvature at that point. However, formerly, porcupines could only be plotted after a move had been made, and the sections refined. With Version 6, porcupines can now be turned on for any number of sections, and they will be computed and displayed in real-time as the surface is modified. These real-time porcupines are computed directly from the surface, rather than from the polyline description of the section, so they do not require that the sections be refined. This feature is similar to the "nudge" macros in Version 5. After a point or patch is selected, you click on the spin buttons on the X, Y, or Z display, and the selected point or patch moves in that direction by the snap increment (holding the CTRL key moves 10*snap increment). This allows you to make small, controlled movements that may be difficult with the mouse. A major advantage of working in this fashion is the ability to move the point in the axis that is nearly normal to the screen, such as moving a point in the Y dimension while viewing the hull in profile. This cannot be done with the mouse, since the editing plane and viewing plane would not be compatible. After each click, the display is updated, so the sections can be displayed, along with their porcupines (see real-time porcupines). The color-shaded surface curvature map can also be displayed, updated after each click, as well as the sectional area curve and hydrostatics summary. Management of multiple parts has gotten even easier, thanks to the Parts Tree. Normally docked on the right side of the screen, the tree gives a hierarchical view of your model. Nodes and surfaces can be dragged and dropped to reorganize them, and right-clicking on any node or surface displays a menu that allows you to change the properties (mesh div, color, offset), or mirror, copy, or delete that node or surface. The Hull Library provides a way to organize hulls according to their type, display detailed information about them, and scale them to the desired dimensions in order to begin a new design. FastShip 6 comes with a standard set of hulls in Library form, and more Libraries will be available for purchase in the future. The Library format also allows you to organize your hulls. Any surface may be saved as a Library hull. In addition to the surface data, you may enter a description, including LWL, BWL, displacement, draft, depth, Cb, Cp, L/B, B/T, Cm, Cwp, LCB/LWL, and LCF/LWL. To make things even easier when using the library, you can also attach any bitmap (.bmp) file, which will be displayed as you browse the library. Do you have an extensive library of good FastShip surfaces? Would they be valuable to other FastShip users? Why not create a Hull Library, and offer it for sale to the FastShip user community? With support for OpenGL, FastShip can rotate fully shaded and rendered surfaces dynamically. FastShip 6 has a "spin" button, which allows you to spin the model by simply dragging the mouse around the screen. Panning is now also dynamic. FastShip surfaces can be rendered with settings for color, gloss index, and transparency. Editing in FastShip Version 6 has a slightly different paradigm. Instead of explicitly defining what each modification will be (e.g. Move/Point or Scale/Patch), there is always a default transformation in effect (Move, Scale, Rotate, Radial Scale). The selection tool is chosen, the point, patch, or part are selected, and the default transformation mode is immediately begun. If you are in the Move mode, but wanted to Scale, simply click on the Scale button, and your selection won't be lost. Version 6 also has new snapping constraints, which can be selected from the Snap Filters toolbar. Snapping can be to a grid, to net vertices (this replaces the MERGE command), geometry (such as the mesh), sections, construction geometry, and offsets. Normally, snapping will occur along any portion of these entities, which means that points may be "slid" along a construction line, a net line, the mesh, sections, or offsets. However, if you want to snap only to endpoints, you can turn on "Snap to Endpoints". 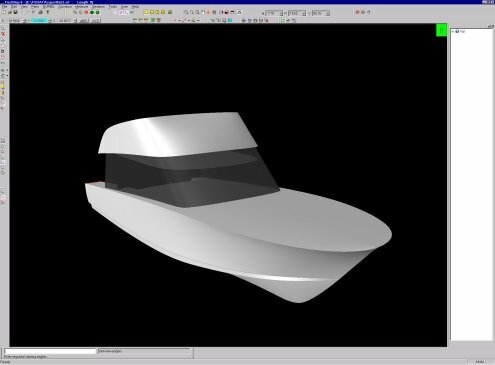 Beginning in the conceptual design phase, new hull forms can be quickly created and analyzed by FastShip and other programs. The hull can then be further refined during the later stages of design, all the way through final fairing for production. FastShip's ability to be used all the way through the design process greatly leverages work done in the early stages, and reduces the number of different programs that must be learned and maintained by the design team. 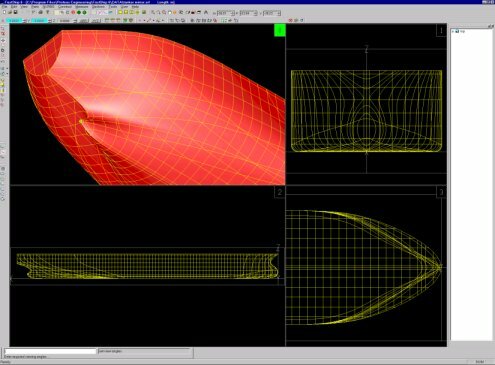 First released in 1983, FastShip uses Non-Uniform Rational B-splines surface mathematics, or NURBS, to allow the designer to interactively "sculpt" the hull on the screen. As control points are moved with the mouse, the hull shape changes in real time on the screen. Stations, buttocks, and waterlines are faired and drawn dynamically, giving immediate feedback to the designer, yielding unprecedented flexibility and productivity. Since hull form changes are made so easily, you are free to explore more "what-if" possibilities, thereby improving your design. 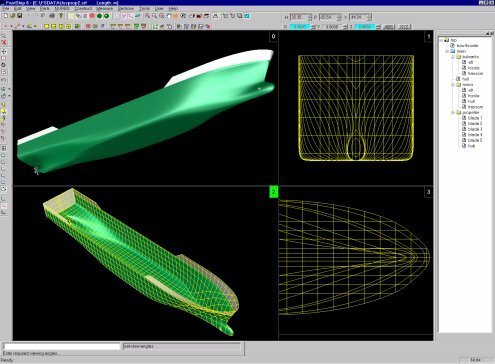 Hull Wizards: with hull wizards, planing hulls and containership-type hulls can be generated in a matter of seconds, by supplying basic information on the overall parameters of the hull. Parametric variation of a Parent Hull: Using the FastGen macros a parent hull can be modified to fit a set of parameters, including LCB location, block coefficient, length of parallel midbody, overall dimensions, and more. New parent hulls can be created by the user by first creating the surface in FastShip, and adding a simple data file describing the topological features of the surface, such as which columns form the boundaries of the parallel midbody. Design from Scratch: Of course a new design may be created simply by beginning with a flat NURBS surface, and then modifying the control net into the desired three-dimensional shape. FastShip's many editing tools and real-time display of the surface make this approach surprisingly fast. Fitting an existing set of offsets: If the user wishes to re-create an existing hull, the offsets of that hull may be entered into FastShip in various formats. For example, station curves in DXF format may be translated into the IDF format, and then read into FastShip. Once the offsets are read in, the surface can be generated using one of the previous methods, and then either manually or semi-automatically fit to the offsets. For more information on fitting surfaces to existing offsets, see the Surface Fitting white paper, available in Adobe PDF format. FastShip can analyze the hull form for fairness, by computing and displaying the curvature of any section or 3D curve. Surface curvature can also be displayed as a color map, including minimum, maximum, average, and Gaussian curvature. Real-time hydrostatics, supplying an interactive sectional area curve as the surface is manipulated, and displacement, LCB, and prismatic coefficient immediately after an editing operation is completed. Output for SHCP, Pias and others are supported as well. Of course the primary output of FastShip is the hull shape. In addition to transferring data to other programs, FastShip can directly output lines drawings to the system printer, be it a plotter or laser printer. Hydrostatics data and offset tables are easily printed, and are also output in a file format that is readily incorporated in a word processor or CAD drawing. In addition to these exporting capabilities, FastShip can import IGES, IDF, DXF, and GF files. FastShip is a proven tool for efficiently designing, modifying, and fairing hulls, appendages, and superstructures. It can be used effectively in all stages of ship design, from concept to final fairing. FastShip forms the foundation for a complete, desktop ship and yacht design system.